The number of rigs drilling for natural gas in the U.S. fell this week as producers continued to scale back exploration and production amid sliding energy prices, but the oil rig tally rose slightly. The number of oil and gas rigs fell to 1,039, down 46 from the previous week, according to rig data from oil-field services company Baker Hughes (BHI). The number of gas rigs was 810, a drop of 47 rigs from last week, while the oil-rig count roseby 2 to 217. The rig count includes 12 miscellaneous rigs. The number of gas rigs in use peaked at 1,606 in September. . . The U.S. Energy Information Administration predicted in its most recent short-term energy outlook that natural gas production would peak at 53 billion cubic feet a day in early 2009 and decline during the second half of the year. The U.S. nuclear power sector may have a few more years in the dark ages before its long-promised renaissance. . . Yet nuclear power is still struggling to win unequivocal government and market support, even as developers prepare to break ground on the first new reactors since 1996. A new nuclear plant costs too much to compete with natural gas or coal. Opponents of the industry have successfully argued that nuclear is too mature a technology to receive new government incentives. Legislation aimed at building up alternatives to fossil fuels has largely left nuclear out in the cold. Some funds from the economic stimulus are also going to develop expensive and unproven technology to capture and store carbon emissions from coal-fired power plants. . . The 26 proposed nuclear plants are for now an industry wish list. Nuclear plants are expensive - Progress Energy Inc. (PGN) recently estimated that two new reactors outside Tampa will cost $7 billion each. Duke Energy Corp. (DUK) plans to spend $1.8 billion to build a coal plant near Charlotte to produce nearly as much as one reactor. "The cost of these plants is quite high...if you look at the companies sponsoring them, that's greater than their entire market capitalization," said Glen Grabelsky, a managing director at Fitch Ratings in New York. The nuclear industry's expansion will depend heavily on a federal program offering loans for new plants. Utilities initially requested $122 billion from the $18.5 billion program, while a handful of projects are moving forward with private financing. The government will have choose only a few of these projects to award funds to. The decline in crude oil prices gets all the headlines, but the first globalized natural gas glut in history is driving an even more drastic collapse in the cost of gas that cooks food, heats homes and runs factories in the United States and many other countries. With industrial and utility use of natural gas declining, gas prices in the United States have already declined by two-thirds since the summer. Prices are not likely to go down much more, experts say, but an increase in imports is likely to keep them low until the global economy recovers and drives demand back up. Gas industry executives expect that liquefied gas imports into the United States will at least triple in the second half of this year. (rut roh raggy - could kill yet another "thesis") That comes as domestic producers have lowered their rig count in natural gas fields around the country by 50 percent in the last several months because of the fall in prices, leading to an expected drop in production by the end of the year. An Energy Department investigation into a plutonium mix-up reveals deficiencies that the New Mexico nuclear weapons lab must address, an official says. The confidential investigation concluded this week that statisticians at the lab had miscalculated the amount of plutonium at its facility and that none was actually missing. Although the finding eliminates the worst-case scenario -- that the material left the facility and ended up in rogue hands -- it raises doubts about the lab's management at a time of growing concern about nuclear terrorism. The Arizona Department of Transportation has begun soliciting bids for highway projects using the first batch of federal stimulus funds, and it says historic drops in construction costs mean the money likely will pay for more roadwork. . .
About half the rural projects involve pavement repairs, heavily affected by the price of asphalt, the tarry byproduct of oil refining used for road surfaces. Its price, however, is the most volatile of highway-construction raw materials. As the price of crude oil shot up last year, asphalt prices spiked 46 percent by September. When crude fell, asphalt costs slipped 16 percent by January. That makes rural Arizona's projects more susceptible to the swings of the global oil market. Shifting the United States to clean-burning renewable fuels has the potential to cut through a thicket of thorny social ills and solve long-standing problems across the entire spectrum of American life, from manufacturing to national security to clean water, the country’s top environmental cop said on Wednesday. U.S. Environmental Protection Agency Administrator Lisa Jackson spoke before 150 scientists, lawyers, industry executives, activists and others gathered at this alpine town for a three-day conference on the country’s energy future. She said weaning the country from fossil fuels remains a top priority of the Obama administration because it offers such a broad suite of solutions across all aspects of American life: rewarding innovation, discouraging pollution, investing in jobs and encouraging energy independence. Oil’s rally to a four-month high is vulnerable to a correction because near-term demand for crude isn’t yet strong enough to support a sustained advance, Goldman Sachs Group Inc. said. . .
Australian officials blocked China Minmetals Corp.'s 2.6 billion Australian dollar (US$1.83 billion) takeover bid for OZ Minerals Ltd., but left room for a revised bid, highlighting the complications that could arise as regulators consider another Chinese company's proposal to invest $19.5 billion in mining giant Rio Tinto. Australian Treasurer Wayne Swan Friday said the government would block the deal in its current form because its Prominent Hill operations are in the Woomera Prohibited Area in South Australia, a weapons testing range. OZ Minerals Chief Executive Andrew Michelmore said the miner is discussing possible changes to the transaction and will make an announcement as soon as possible. Coal, more than any other fuel, powers the planet. It is the primary source of electricity in dominant economies from the U.S. to China to Germany. In all those places, coal is cheap and, unlike oil, domestically plentiful. Its use is rising, particularly in developing countries that soon will consume more energy than the industrialized world. . . Right now, clean coal seems both possible and improbable. The basic elements of clean coal are already in use in small corners of industry. But whether it is broadly and quickly adopted around the world will depend less on science than on economics. Cleaning coal is very expensive. Home to one of the world's most advanced clean-coal tests, the Pleasant Prairie power plant exposes the hyperbole on both sides of the debate. Fired up three decades ago, the plant has run full-bore ever since, adapting time and again to new environmental rules and still churning out some of the cheapest energy in the nation. It burns some 13,000 tons of coal daily to produce 13% of the electricity consumed by all of Wisconsin. It is 20 years since the Exxon Valdez supertanker ran aground in Alaska, spilling 38,000 tonnes of crude oil into the sheltered waters of a picturesque sound. It wasn't the biggest oil spill recorded but it was, arguably, the most iconic. . .
One of the biggest lessons is the lingering effect of an oil spill in a sheltered area with soft, sandy sediment - exactly the kind of environment found in the shallow areas of Prince William Sound where some of the oil came ashore. . .
"When you look at the effects of natural weathering, it can actually be better than intervention," he adds. Winds, tides and bacteria can do the job just as well, he says. New Zealand may turn to pedal power to revive its sinking economy. In a bid to boost employment and tourism, Prime Minister John Key is promoting a bike path winding about 3,000 kilometers (1,865 miles) that he says would generate 4,000 jobs during construction and entice cyclists to tour the country. The project -- which would cost at least NZ$50 million ($28 million) -- is one of almost two dozen that government and business leaders are evaluating following a jobs summit Key held last month. Several proposals support the tourism industry, which accounts for a tenth of the NZ$180 billion economy and employs 187,000 people. Sharp Corp., the world’s second- largest solar-battery maker, rose to the highest in more than two months in Tokyo trading on a newspaper report the company may ally with Toshiba Corp. to make solar-power generation systems. Chinese industrial companies’ profits dropped for the first time on record as the global recession cut demand for exports from the world’s third-largest economy. Net income sank 37.3 percent in the first two months of 2009 from a year earlier to 219.1 billion yuan ($32 billion), the statistics bureau said today. . .
China Shipping Container Lines Co., the country’s second-largest cargo-box carrier, said yesterday its 2008 profit tumbled 99 percent as a global recession caused rates to plummet. . .
Today report showed profits dropped 86.1 percent for oil and gas exploration companies, 96.3 percent among electronic and telecommunication manufacturers and 77 percent for power generators. The U.S. will announce a U.S. fuel- economy requirement of 27.3 miles per gallon for 2011 cars and light trucks, an increase of 2 mpg, as early as today, an Obama administration official said. The standard for cars will average 30.2 mpg, up from 27.5 currently, and 24.1 for light trucks, up from 23.1 mpg for 2009 models, according to the official, who declined to be identified because the targets haven’t been announced publicly. The guidelines are part of a 2007 law intended to curb emissions and fuel use. Southern Star has successfully drilled and logged the targeted Haynesville interval in its Boyce-Pate 16-1 Well, with positive results. This well is strategically located in the east-central section of the Company's Sentell Field in Bossier Parish, Louisiana. This well successfully encountered its Cotton Valley target, logging 66 feet of net gas pay in the Davis Sand intervals before the Company drilled ahead to further evaluate the well's Haynesville potential. The Boyce-Pate 16-1 Well reached a total depth of 11,200 feet on March 21, 2009. This is the third well in the Company's Haynesville development program, and the last of three Haynesville Shale vertical test wells in the Sentell Field planned this year. . .
Gibbs continued, "Despite the recent drop in commodity prices, the Cotton Valley and Haynesville formations may be two attractive plays in the continental United States. Research sponsored by the US Department of Energy has yielded a way to distinguish between groundwater and the water produced with coalbed natural gas, which could boost CBM production in Montana and Wyoming. The breakthrough could help regulators ensure that produced water doesn’t contaminate groundwater wells, an aspect of development that has drawn fire from residents and environmental groups. Researchers at the University of Wyoming used differences in the isotopic carbon-13 to carbon-12 ratio to differentiate between groundwater and produced water. According to a report by Dow Jones Newswires, a leasing ban has been included in a U.S. bill that puts more than one million acres of land in Wyoming off-limits to oil and gas exploration and development. The purpose of the ban is to secure more than two million new acres of wilderness. Cleared by the Senate, the bill was given the go-ahead by the U.S. House of Representatives on Wednesday when it passed after a 285-140 vote and is expected to be signed into law by President Obama, the report said. Crude oil resumed its rally and closed above $54 for the first time this year on Thursday as U.S. stocks surged on upbeat economic data and earnings reports. We are faced with three serious problems that are going to bring about radical changes in our lifestyles. In order of urgency, the problems are the great economic recession/financial crisis, the peaking of world oil and other fossil fuel production, and global warming. The opening effects of these problems are already upon us, but it will be months, years, and in the case of global warming, decades before their full impact is felt. . .
Energy, how much it costs, where we derive it from, and the conflicts that arise are heated political issues in this day and age. The energy debate has lasted for generations and will no doubt continue to. But using the internet as a resource, users can sift through information, separate research from opinion, and draw their own conclusions using what we consider to be the 50 most influential blogs on the issue, listed below. . .
A dangerous and controversial source of energy, these blogs contain news, information, research, and the various myths on oil. Whether you believe oil has a fast approaching peak or is still the best option for energy, these blogs will inform, as well as entertain. 40. The Oil Drum: This blog’s mission is to facilitate civil, evidence-based discussions about energy and its impact on our future. The Oil Drum’s goals are to raise awareness, host civil discussions, conduct research, and create a community committed to a solution. Visitors can read about oil in different regions of the world, get updates, and join in the discussion. Prices of natural gas fell sharply following the release of U.S. government data showing a surprise build in the level of gas in storage last week. The U.S. Energy Information Administration said the amount of natural gas in storage rose by three billion cubic feet in the week ended March 20, bringing the total amount of gas in U.S. storage to 1.654 trillion cubic feet. That is 29% higher than at the same time last year and 20% higher than the five-year average. The report caught market participants by surprise and could mark the end of the natural-gas-withdrawal season, when gas is pulled from storage to meet demand for heating. Analysts and traders surveyed by Dow Jones had expected storage levels to fall by 11 billion cubic feet, according to an average of estimates. Rio Tinto has other options if its $19.5 billion transaction with Aluminum Corp. of China, fails, Rio Tinto Chief Financial Officer Guy Elliot said. "Like any prudent company, in these uncertain times, it is, of course, sensible to consider contingencies," he said, after speaking at the Asia Mining Congress in Singapore on Thursday. "This is the way we always work." What's proposed is an investment in Rio Tinto by the state-controlled company, known as Chinalco, with the Chinese company increasing its interest to as much as 18% from 9%. But in the unlikely event of the deal not going through, the Anglo-Australian company has other options, such as a bond or rights issue and more asset sales to raise funds, he said. Can someone point me to a short video (You Tube, etc.) that explains the issues with Peak Oil. My audience is my Board of Directors, so I can't use Kris Can, and "End of Suburbia" is too long. I need like 7-9 minutes. The video should lay out the technical issues, with historical examples and then extrapolate to the current plateau/peak. I also can't use JH Kunstler telling us that Suburbs are doomed. No speculation on implications, not yet. Nearly all of the economic analyses we see today have as their basic premise a view that the current financial crisis is a temporary aberration. We will have a V or U shaped recovery, especially if enough stimulus is applied, and the economy will soon be back to Business as Usual. I believe this assumption is basically incorrect. The current financial crisis is a direct result of peak oil. There may be oscillations in the economic situation, but generally, we can't expect things to get much better. In fact, there is a very distinct possibility that things may get very much worse in the next few years. In this post, I will put together some of the pieces I see. This post is based on a presentation, so includes more than the usual amount of graphics. The post repeats many things I have said before, but I wanted to bring more of the pieces together into more of an overview article. This is a link to a PDF version of the presentation. This is a link to the Powerpoint version. And you can fire at least one of 'em and replace him with Gail. If the audience is at all sophisticated (and since this is a board level presentation I assume that this is the case) then Gail's presentation is likely to fail. Her materials do not prove this chain of cause and effect. Like we don't know what's causing the cancer but we know this isn't it. depletion is the best case scenario. what she explains is that this economy depends on cheap energy, increasingly available. The combination of this conditions ended last year. Maybe she has read the book 'from mass-economy to information-economy' from Paul Hawken, written in the '80's when oil prices rose and industries started to suffer because of that. IMO her presentation cannot fail. what she explains is that this economy depends on cheap energy, increasingly available. The combination of this conditions ended last year. Hawkins is a Neo Smithian, and has completely missed the boat. Capitalism will not save us, and is a major problem going foreward. My board is composed of elected officials (it's an MPO). But really, I'm not looking to go beyond the basics of PO. The geology leads to a bell curve of production, etc. I want to get across the idea that eventually each year's production goes down. IF I get permission from the Executive Director to go this far, I'll move on to the implications later. Yeah ... when I gave a similar presentation to a corporate VP once, the question I was not prepared to answer was "So how do we make money off this?" I put together a slightly toned down version of my presentation from earlier this week. It is clearly not for a 7 to 9 minute time slot, but it will probably get less "push back" than the original version.
" I need like 7-9 minutes." This one is 10 minutes and is really good. But if you just google YouTube Peak Oil you will get many more. I just watched the Crash Course the other day, I think it is all very interesting, I learned from the course how the numbers have been fudged or years, the fuzzy math and how the economy had been in recession for longer than the Government had admitted to, I have to wonder, if based on the real (non fuzzy) numbers, whether or not we are actually in or near to being in a depression? I have been recently been using the overall Lower 48 (which had only minor restrictions on drilling) and North Sea as models for the world. 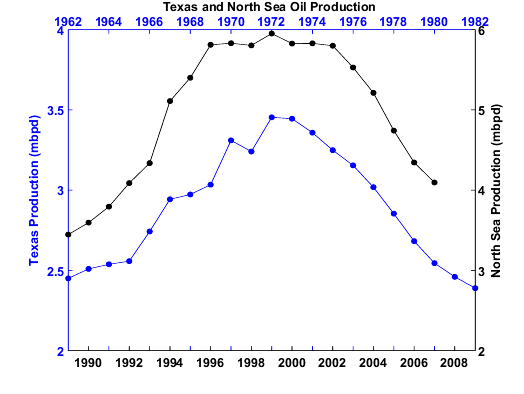 Mathematically, the world was to 2005 as 1999 was to the North Sea as 1970 was to the Lower 48, i.e., conventional crude production in all three cases was about 50% depleted. The initial average three decline for the Lower 48 and North Sea was about -1.0%/year, but the average decline in following six years was about -6%/year. Relative to the Lower 48/North Sea models, the world is at the start of the six year period when the Lower 48/North Sea showed a sharper decline. Clearly, world oil production fell in the last half of 2008, especially in the fourth quarter, due to lower demand, but as I have said before, I wonder if declining demand is masking an accelerating decline in production. The EIA numbers, subject to revision, were 74.8 mbpd for 7/08, down to 72.8 in 9/08 and ending 2008 at 72.8 in 12/08. As I said, clearly there was a demand factor, but in September, oil prices were still over $100. In any case, the annualized production decline rate from 7/08 to 12/08 was about -6.5%/year. WT happen to spend a couple of days in your fair city this week trying to shake a few shekels out of your restaurant and food processing companies (DFW is the the pizza topping capital of the the U.S.) and still never cease to be amazed at the continued sprawl and activity. Was surfing the radio stations and heard a car dealer advertising the Tundra? (think it was) for 1/2 price $14,500 vs a sticker over $29,000. Thought that was a pretty incredible deal of course it was a car dealers add so you do have to discount it. Nevertheless saw a bundle of 30 day tags and the dining establishments were quite busy. You're economy seems to be holding up pretty well. Making fast work of "We Had Everything but Money" Interesting read. What's next on the list? I've been mildly surprised at how many restaurants are still pretty busy, especially since I'm brown-bagging lunch these days (I now wear black and play "Taps" when I open my oil run checks). On the other hand, there have been a lot of restaurant closings, so maybe the survivors are getting a higher percentage of reduced total volume. So far "only" 10% are unemployed, so many most of the rest are still eating out? I know my daughter, who waits tables on college breaks, gets good tips and plenty of shifts. Part of may be to a "work hard, play hard" mentality for the weekend bar business. Did you watch the BBC Future Farm video that has a post at TOD from last night? I thought the intro was a great way of tying Oil to AG as an example of a major industrial benificiary that would be threatened by PO. On-Cameras with Colin Campbell and Heinberg, who summarize the overall energy problem pretty succinctly, while the tone of the piece doesn't seem wild-eyed or offputting to me.. I just started sending email links of this Documentary out to my family, as I felt it was (finally) a very 'digestible' presentation of the issues.. If China is kept from buying Rio, it's over. I was struck by how slim Rio Tinto's option were--"bond or rights issue and more asset sales". Rio Tinto is one of the big uranium producers, so this is not good news for the nuclear industry. it out of China's hands. China's Ministry of Railways (MOR) signed a deal with state-owned vehicle producer CNR Corporation Limited (CNR) here Monday to purchase 100 high-speed CRH trains for 39.2 billion yuan (about 5.74 billion U.S. dollars). Australian officials blocked China Minmetals Corp.'s 2.6 billion Australian dollar (US$1.83 billion) takeover bid for OZ Minerals Ltd., but left room for a revised bid, highlighting the complications that could arise as regulators consider another Chinese company's proposal to invest $19.5 billion in mining giant Rio Tinto. . . Blocking of the bid leaves the debt-laden OZ Minerals in a difficult situation as it tries to extend A$1.1 billion in loans due by Tuesday. Banks were expected to roll over the debt for another month, but the implications of Mr. Swan's decision are unclear. The miner, which has total debt of A$1.3 billion, had previously warned it risked being placed into receivership if the takeover bid failed. One has to wonder if china has a list of companies to buy before dropping the dollar and letting the united states crash. I have mixed feelings about this since I know some people laid off from an OZ Minerals nickel mine up the road a ways here in Tasmania. I think the fact that the Prominent Hill mine in South Australia is in a military rocket range is an excuse. Knowing that there are also big Chinese bids for other mines the government wanted to look tough. OZ Minerals also upset shareholders by paying an executive an $A8m bonus when it was voted against. Prominent Hill though nominally gold and low priced copper may contain a tad of uranium being near to Olympic Dam. They even think a coal deposit in the area could contain uranium. Maybe they didn't want the Chinese getting their hands on it. See why Australia has so much uranium. The "West" is not some monolithic entity as this implies. First, CSR got a lot of its technology originally from Siemens, a German company, and Siemens owns a large share of CSR; China is in this instance in effect propping up the economy in a major western state. Second, CSR was until a few years ago an SOE (State owned enterprise), but is now "private," but is still heavily subsidized by the state, so this is like the state's left hand buying from its right hand. Rail is, after all, a huge part of China's transportation system (and CSR makes and has made a large share of the rolling stock in China). CSR also makes wind turbines. Even the threat of a surge of LNG is probably enough to keep drilling activity further suppressed which would make the U.S. more dependent on another energy source that may or may not show up in the ports. The ng futures price has plummeted back under $3.80. Anyone like to hazzard a timeframe for when US NG is likely to start a recovery? It seems like natural gas prices might rise this coming winter at earliest. But so many companies will be completely out of the market by then, and so many workers will have left the industry, that higher prices won't bring up production much, very quickly. With the continuing recession, it is possible a price spike won't come until winter a year from now (2011). That's a badly written article. Think they started with the headline but the article body doesn't support it. The quote they base the headline on is: "We don't see a volume of LNG that would depress the U.S. market until mid-summer at the earliest." Europe likely needs a lot of LNG this year. The US doesn't. Incidentally I see Simmons has dropped the slides claiming Russian Gas is post peak from his latest powerpoints and replaced them with the claim that worldwide gas production "may be peaking now." (which still implies Russian Gas is post-peak without pointing the finger directly at Moscow). The link "The Peak Oil Crisis: Pondering the Near Future" is broken. Fixed it. Our link is back to the original article. Tom is sounding more like JHK with every column, my new canary in the coal mine is if Tom stops writing from Northern VA and gets a byline, say writing from West Virgina or upstate N.Y., I'm moven back to Aroostook County when that happens. Could it be that CERA and Daniel Yergin have seen the light? The report by Cambridge Energy Research Associates, an oil consulting firm, said that the potential drop in production capacity is a "powerful and long-lasting aftershock following the oil price collapse." The global slowdown has forced oil companies to slash their investments, postpone or cancel expansion plans, or delay drilling in many corners of the world. While some of the biggest companies, like Exxon Mobil and Royal Dutch Shell, say they will keep their investments unchanged this year, many other producers are curbing investments because of the crisis. CAMBRIDGE, Mass., Mar 23, 2009 (BUSINESS WIRE) ----North American natural gas is entering a new era in which supply is no longer constrained, according to a new Cambridge Energy Research Associates (CERA: undefined, undefined, undefined%) multiclient study, Rising to the Challenge: A Study of North American Gas Supply to 2018. A revolution in technology has unlocked "unconventional" gas resources, dramatically changing the prospects for the market. Demand, rather than supply, will be the challenge for the market going forward, accentuated currently by the economic crisis. ...Given the increased productivity of unconventional wells, the study concludes that it is not necessary to increase drilling activity to maintain - or increase - production. After years of developing unconventional gas with its long-lived production, in the aggregate, the average decline rate will fall. This means, the study says, that a smaller quantity of new production is required to offset natural production declines. "supply is no longer constrained"?! Perhaps one of the "unconventional" sources is a new device that can convert stupidity into natural gas. That quote had me shaking my head as well. It wears you down after a while. If prices are low ... it proves current abundance! If prices are high ... look at the abundance of resources that are now profitable! steve et al -- My cohorts and I did more then shake our heads….we had the best laugh in months. Thanks CERA. Most know I consult for one to big UNG players. Or one who used to be before dropping our rig count from 60 to less than 10 in the last three months. Interesting that CERA says we don’t have to increase drilling activity to keep production rising thanks to these “long lived reserves”. True…many of these wells will produce for the next 15 or 20 years. But the fact that the recovery from the last 90% of the life of such wells will typically be less then 15% of the URR doesn’t seem to catch their attention. OTOH, I’ll add that the big cut back in drilling won’t send NG deliveries off a cliff as I once thought. My rough model shows more of a gradually declining plateau for the next few years at least. Most of the UNG wells have already declined significantly but they are a lot of them which are now in the low rate/low decline rate stage so they thus make a fairly substantial base. The new Deep Water NG coming though the Independence Hub will also moderate overall decline. But the DW fields also have a relative short peak period: 5 or 6 years. I will also add that, IMHO, we’ll have enough domestic NG to supply demand for many, many years. The trick part of that statement is the return of price supports as demand increases or supplies dwindle (or the likely combination of both). The results of the last few years of UNG development have proven a huge volume of recoverable reserves WHEN THE PRICE IS HIGH ENOUGH. Unlike oil which will never see a significant long term development domestically even if prices rise to $150/bbl or greater again. The resource (not including oil sands) just isn’t there. But the NG is there and we know how to recovery it. It’s only a matter of price support. But that support won’t develop until we have a significant economic recovery IMO. And then it might be even longer after demand recovers: see LNG imports below. LNG is another tricky issue subject to how you frame your expectations. As far as LNG not having a market in the US I’m not sure. The EU might have a bigger demand and can thus pay the freight. But that doesn’t mean there isn’t potential for dumping excess LNG into the already suppressed US market. It all depends on exact numbers which I haven’t seen yet. If the unsupported reports are correct there will be a large volume of exported LNG developed in the next 12 to 18 months. And reports that the current excess tankerage and supply could drop the delivery to US ports at a price under $3 to $4 per mcf. These prices offer little chance of profitable recovery of the many billions of $’s spent to build those liquefaction plants. But that is a sunk cost. Operators of those plants have contractual obligations to the royalty owners and partners: typical sovereigns and NOC’s who won’t hesitate to seize those plants if given sufficient cause. As long as there’s a positive cash flow those NG reserves will be produced. This potential “dumping” of LNG into the US market is a major concern seldom highlighted publicly by the US NG producers. IMO this concern has curtailed NG drilling as much as the collapse in prices. Insider knowledge. Someone mentioned the potential for drilling to kick back in should NG rise during the summer or fall. Not going to happen even if prices come up substantially IMHO. The ’09 budgets are etched in stone. And so is a good bit of the 2010 budgets. The capital constraints the industry is suffering from today won’t disappear even if NG rise 50%+ in the next few months. The productivity of the Haynesville Shale will keep it progressing. I suspect it will take a couple of years at a minimum before we see most of the other trends kick back in. And that’s only if we don’t have large scale dumping of LNG into the US. Which could be good news for the country (but not us) if we use this breather to start utilizing NG to a greater degree. Better to burn cheap Persian Gulf LNG then our NG resources. This will take decades to implement to any great degree IMO but at least we have the resources to do so domestically. If there any real hope for economic expansion to kick back in (at least for a while) it will be better to base it upon NG then coal. Rockman truly appreciate your comments although financially they HURT! I have built a strong position on Natty under the impression that we would see rapid declines in production and limited LNG due to the international premiums. Also expected more demand due to fleet adoption and coal related issues. These now look like IGNORANT reasonings wished I had figured it out a bit sooner. I have certainly been surprised the production has remained so strong given the prices and had assumed given all the talk about rapid depletion of the UNG that we would be seeing more declines in inventories. I have begun to think the natty producers were about as reliable as OPEC in reducing supply meaning lots of people talking one game and doing the other. It still suprises me that like the farmers the Natty producers can't stand prosperity. Hope your gig holds up and please keep your commentary coming. My guess is that LNG will be a minor factor. The two primary variables IMO will be the production decline versus demand. In any case, as a NG guy told me years ago, if NG supply exceeds demand by 1%, we have a glut, if it falls 1% below demand, we have a shortage. In any case, as a NG guy told me years ago, if NG supply exceeds demand by 1%, we have a glut, if it falls 1% below demand, we have a shortage. Yeah and with Natty inventories at +29% to last year and +20.4% over the five year my diaper rash is getting serious! My gut keeps telling me that on the LNG but the supposed abundance is just more reason to keep the price down for now. Ma Nature is spanking our rear ends today in South Central Ks. the ice pellets hitting the windows got so loud I almost had to turn up CNBC. Well not quite that loud... at least the ice didn't shut off my dish and I could still read the crawl. Ma Nature is spanking our rear ends today in South Central Ks. negative net withdrawls refences excess supply over consumption. '05 and '08 seem to fall above the trend, perhaps representing "speculation" associated with the hurricanes. we need to keep in mind that supply includes imported ng and lng. True…many of these wells will produce for the next 15 or 20 years. But the fact that the recovery from the last 90% of the life of such wells will typically be less then 15% of the URR doesn’t seem to catch their attention. What decline model do you use for this extrapolation? Something more gradual than exponential decline I imagine? ROCKMAN to echo WHT a bit I think your simple model is probably right right at the top of the curve where decline is fitted with a linear model I'm assuming because you say its simple that its linear. However it diverges fairly quickly if the underlying decline rate is exponential or higher. Your probably not include the underlying decline in conventional NG sources. My opinion is Simmons almost cliff like conventional projections are real unless someone else does another review of future conventional production. New conventional production is low and final decline rates are still high for conventional despite the longer field life. You have to have a exponential increase in UNG at least to offset what I'd argue are reasonable decline projections. Regardless the initial decline is still well fit by a linear model and a small uptick in UNG production will cover the decline for a few months at least it depends on the model etc but 6-12months is probably a reasonable range before the various exponentials start showing their true force. Also of course now that we have significant UNG production new UNG production has to cover the steep declines of both UNG and the original conventional decline rates. The fact that the initial burst of UNG production resulted in a net increase in gas production is more a matter of math than any intrinsic reason. The conventional decline rates had just reached the point that UNG was profitable and the first burst of UNG expansion only had to cover this relatively low decline rate in conventional production. Its effectively a one shot boost. Same for that matter for various offshore plays they work relatively well at maintaining production of both oil and NG intitially but the next wave of production additions face a much higher overall decline rate that has to be overcome. Bottom line don't be fooled by the math right at the start it quickly works out if the system is in at least exponential decline. This does not prevent a number of different results right at the start where many of the variables can match linear declines or even constants. For dispersive discovery, which is similar to hyperbolic decline of order 0.5, the time/cost trade-off goes according to loge(1/(1-P)) where P=fraction of cumulative growth reached. So to go from 0.9 to 0.999 of asymptotic growth will take three times as long as to go from 0 to 0.9. The time period that this extends has a lot to do with what economic limit is set for a field. The international community should recognise that the trend towards economic globalisation is irreversible and should take credible steps to reject all forms of trade and investment protectionism. Article written by Wang Qishan,Vice-Premier of the People's Republic of China. For anyone who thinks the "global economy" is going to fade away without a fight. I fixed the link. It was missing a quote mark at the end. "By proposing such a sweeping reform, China is demonstrating its growing influence in reshaping the global monetary system, and is now on offensive in the debate of who is responsible for the global imbalances," Deutsche Bank's chief economist for Greater China Jun Ma said in a note to clients Wednesday. The comments by People's Bank of China Gov. Zhou Xiaochuan are setting a framework for talks on how to resolve the huge trade imbalances between China and the U.S., analysts said. Gail - thanks for fixing the link. And thanks for the WSJ article link as well. It strikes me that so much of our understanding of our current economic situation gets skewed by continued efforts to spin the news through the spectacles of nation-states. Also, I wonder if, back in the 70's when the "Trilateralists" were plotting out the final stages of globalization whether they realized that the plan to include China was going to mean that there would be new members of the "Commission." Clearly, they already understood that it wasn't just a Western European club any longer, as the Japanese were full partners. Still, its a global system that is dominated out of New York, London, and Tokyo. I marvel at the ability of the Chinese (especially the CP in Beijing) to garner so much attention in the media. In some ways, despite their background, they appear to be the last great nationalists amongst the globalization leadership. Some worry that stimulus spending will stop foreign governments from buying Treasurys. "I don't think we'll have to worry... about what happens if the rest of the world bails on the US. If that happens, then the American economy is in for a lot more trouble than it already is in." See, it's not the government that is bailing us out, folks. It's China. Where do you think the money ultimately comes from? Simply put. The magic checkbook will loose it's magic and the united states will cease to exist as any sort of power. What you seem to be missing is that these are not separate economies. The Chinese can not simply "drop the dollar." They have to put their money somewhere, do you see a safer place the T-notes? If the Chinese did, they'd be putting their money there. Despite the hyperbole that comes from the media, China is still a bit player. The EU and US make up well over half of the global economy (except in the "CIA Factbook" which increasingly appears to be made up stuff). The notion that China, with its piddly little $1.2 Trillion to spend on T-notes can change the direction of the global financial system is just nonsense. The reality is that the Chinese are dreadfully fearful that the US (and European) economies will continue to decline. If they do, the Chinese are out of luck. They are not yet at the point where they can continue to generate internal growth without their export sector and foreign investment driving it. Yes i know they have to put their money somewhere. Though what you seem to be missing is that once one player 'stops' believing in the 'magic checkbook' of the us dollar other players will start to move away as well. So basically it doesn't matter how much china has, the simple act of a growing economy saying 'we do not think the dollar is safe enough to invest in' Will be enough to cause others to move their money elsewhere as well. 'we do not think the dollar is safe enough to invest in' Will be enough to cause others to move their money elsewhere as well. The issue is more basic than that. If the interlinked global economy is in freefall and the G9 are all running deficits, then who is it who has the funds to invest several trillion in US paper? The OPEC nations are in a bind due to the drop in price of their chief export, China and Japan are both having problems, the UK has been Browned to the point you can stick a fork in it, the French are in uproar and the Germans ticked. So where is all the money going to come from? This week the major buyer was the US Fed. The US transferred debt obligations from the left pants pocket to the right pants pocket and deems this a valid transaction. You don't have to worry about money moving elsewhere. You just have to worry that somebod, somewhere, still runs a surplus. And that is increasingly unlikely. Has not the US really just become another Giant Ponzi Scheme? Far worse than Madoff's, Spending Trillions of $US and financing this country with Bonds, T Bills and Printing Press $. The ultimate check kiting scheme. Just like with other Ponzi schemes those in the back of the line will get nothing, The US Government may not default, but then the US currency will be separated from any connection it has or has had with anything of actual value, like the old Weimer Republic or current day Zimbabwe, Hyper inflation will ensue, those folks with property and mortgages will be able to sell an old silver dollar and pay off a few months mortgage or more, this will end the foreclosure crises but kill the banks and what is left of the economy, Houses will be paid off but a loaf of bread will cost a million bucks. China is right now in the position of not wanting to start the run until they have bought up a bunch of hard assets, they have a trillion $ US T-Bills, they do not have to start a run all they have to do is use those T-Bills as collateral to purchase hard assets, Oil, Plows, Trains, things that have value, or to trade the T-Bills for debt that they owe, then once they have picked up a bunch of shiny new toys, and commodities like Maze, Wheat, rice futures as well as control of companies that produce Oil and other hard assets like Copper, If the US falls into the abyss because the rest of the creditors start to cash in the US debt, China can sit back and watch the true economic collapse of the west, become the last superpower, while we end up like the USSR with our ships welded to he docks because we have no fuel to run them. Doubling the deficit over the next tne years is a serious risk given the big spending budgetary desires of Washington and Wall Street. If GDP remains constant adjusted for inflation that would put the United States at one of the highest debt level per real GDP rankings in the world. Iceland and Zimbabwe are the only two with debt to GDP ratios of higher than 2/1. The United States did not always include money it borrowed from the Social Security fund as public debt. With baby boomers retiring the fund will be in a deficit. Lack of tort (lawsuit) reform has driven health care costs to the stars. This is inflating the costs of government Medicare and Medicade. Lack of tort (lawsuit) reform has driven health care costs to the stars. This is inflating the costs of government Medicare and Medicade. Tort reform is a drop in the ocean. A political smokescreen. a smokescreen for just one of the ways the "healthcare" industry has managed to loot the treasury. Drug companies have invented more new drugs and cures than NIH or the treasury. Drug sales have provided much tax money for the treasury and jobs for Americans. Lawyers who cannot cure asked for remedial payments in excess of what should be allowed. Lawyers want no limits to pain and suffering awards. Who is looting who? Those who cannot cure called those who could, "thieves." Lawyers cannot come up with new drug formulas for what ails you, ehy sued those who could. Ok, so the Chinese CP stops believing - what do they do with their money and who does that really hurt? Even if EVERYONE stops believing in the US dollar, where do they move their money and who does that really hurt? There is NO alternative. If the dollar collapses then the whole global economy is toast, burnt at that. The CP leaders know this. That is why most of their pronouncements lately are encouraging the US to strengthen the dollar. I think that they are trying to find some way to convert their US$ into SDRs. Pretty difficult to do. China is a joke and a sick joke at that.They have constructed a house of cards on another house of cards.All the blather about a new world currency and their concerns about their self-inflicted creditor to the sick US problem - just exactly that - blather. Some opinion from the "rest of the world:"
“(It is unfair) that the (poor) be the first to pay the bills of a crisis created by the rich – not by any blacks, by any Indians, or by any poor,” said Mr. Lula. “This is a crisis fomented by the irrational behaviour of white and blue-eyed people, who before the crisis seemed to know everything,” said Mr. Lula, who has often blamed the United States for causing a global crisis by practicing “casino capitalism”. This G20 meeting seems to be much more important and pivotal than previous ones. It will be interesting if the participants deem it as such or just try to maintain status quo. We are running out of chances every time we "maintain" business as usual. Unfortunately, as the Vice-Premier makes clear, there are no alternatives being considered. The only discussion is how to get back to BAU. "The United States of America did not choose to fight a war in Afghanistan. Nearly 3,000 of our people were killed on September 11, 2001, for doing nothing more than going about their daily lives," said Obama, who has vowed to make Afghanistan the central front in the war on terror. "The safety of people around the world is at stake," Obama said. "So let me be clear: al Qaeda and its allies -- the terrorists who planned and supported the 9/11 attacks - are in Pakistan and Afghanistan. Multiple intelligence estimates have warned that al Qaeda is actively planning attacks on the U.S. homeland from its safe-haven in Pakistan. And if the Afghan government falls to the Taliban -- or allows al Qaeda to go unchallenged -- that country will again be a base for terrorists who want to kill as many of our people as they possibly can." The terrorists, apparently, already have a base in Pakistan, which is less accessible than, say, a base in Afghanistan. Fighting is Afghanistan will supposedly deny them a base in that country. But if they are going to have a base, wouldn't it be better if it were in Afghanistan than Pakistan? While we regularly send drones into Pakistan, are we planning a full scale invasion? Killing a few terrorists here and there with drones does not seem like a strategy for effectively wiping out terrorists. And then there is always Saudi Arabia, various African countries, and Iran. Anyway, if Al Qaeda is planning attacks from Pakistan, how will we be safer by continuing this endless war in Afghanistan. I hate to say it but I think we might have Bush Lite with respect to the war on terrorism. Why have we not been attacked since 9/11 anyway? Because we are in Afghanistan? It just does not compute for me. Also, who are all these people who planned the attack on 9/11? Are there, like, a thousand planners in Pakistan and Afghanistan. Again, I would think this would be a small group. And, clearly, it does not take that many people to do a 9/11 type attack. The less the better from an Al Qaeda perspective. Obama is bloviating because he does not think Americans can handle the truth, which is probably true. I am sure it wasn't covered much in the USA media but here in Canada we had a top government official (a guy possibly being groomed to be a future leader of the country) banging some chick with a very shady past-her previous boyfriends were top Mafioso and Hells Angels. Anyway, he was delivering top secret documents to her in the course of their relationship and it got him ousted. She now claims that her told her that Canada's military involvement in Afghanistan (which has killed a very high number of Canadian troops) was about protecting the global heroin trade-he denies telling her this (obviously). I think you are twisting the data a bit. I have no desire to defend this official, but I do have some desire that the truth not be twisted like a pretzel. "..future leader"??? That was hardly a likely bet, even at the best of times. "...delivering top secret documents"??? Delivering is a pretty strong word. 'leaving about' is closer to it. I agree he should not have even done that, and was pretty stupid to do so, but I doubt very much that he was "delivering" which implies some sort of demand or expectation on her part. Where is the evidence for that? "...protecting the global heroin trade". She 'said' this. News to me, but then I don't usually read the National Enquirer. Besides, don't you think that her credibility is a little strained, at least among most Canadians. Nobody knows for sure what went on, but he admitted to leaving top secret documents in the apartment of a woman he was in a relationship with, a woman with her own security company and a woman with ties to both the Mafia and the Hells Angels. Your doubts are your own but they don't change the facts that he has already admitted to. This is definitely a case of a government official getting into bed with the wrong person. Both literally and figuratively. She had a couple of priceless assets. These may have caused a strain in various places, but not in her credibility. After all, the government changed its bid requirements to make it possible for the real estate she was marketing to meet its needs. As for a future leader, we need one now, not two, three, or 10 years from now. Surely it is about time that the West's commitment in Afganistan(and Pakistan)is examined in the hard ,cold light of reality? GWB,Cheney,Rumsfeld and the rest of that scurvy crew are history.Or are they? 9/11 is history.Al Queada is history.Terrorism is a police and border control matter. There are much more pressing issues than manic Islamists in some forsaken Central Asian hole. Let's get the hell out of the place and let the fools settle their tribal and religious differences with their Chicom AK47s and RPGs or locally produced replicas of same. And,if the mad Pakis let loose with their big bombs,I'm sure the Indians can respond appropriatly.Bad cess to the lot of them. If it wasn't for interfering abroad, stealing resources and encouraging drug trade (purposely wrecking economies and countries along the way, Shock Doctrine, 1 percent doctrine, mind you) , terrorism would not exist. And again Obama is full of sh*t. There is NO PROOF of whom perpuated 9/11. More money was spend on trying to impeach Clinton for the Lewinsky nonsense, then on the 9/11 truth commission. If there is any proof, let's see it. So far I haven't. "The safety of the people around the world is at stake" MY *SS! Obviously Afghanistan and Pakistan are very strategic when it comes to Caspian resources in China's and Russia's backyard. The country has changed over the last 35 years-the Watergate hearings were broadcast live over the major networks-the 9/11 hearings were held in secret with no public scrutiny in any way. I see a problem here, but 99.9% of the sheeple apparently do not. Your friend is absolutely correct. Sadly, the sheeple are completely unable to conceive of the idea that other people around the world take offense to destructive intrusions into their local affairs. I was struck by the language that was used by the POTUS in this address. It could have been lifted verbatim from any one of a dozen GWB speeches. Personally, I think the Asia Times article "Welcome to Pipelinistan" provides a far more credible argument regarding US interests in Southwest Asia than POTUS claiming, "...the safety of the world is at stake..."
You need to read this story Liquid war: Welcome to Pipelineistan to place above story in its proper context. Japan’s consumer prices stalled in February and retail sales tumbled the most in seven years, signaling a return to deflation is likely to deepen the recession. Britain suffered its first failed government bond auction since 2002 on Wednesday after bids fell more than 100 million pounds short of the 1.75 billion pounds the government was trying to raise. Of course, comparisons to prior bear markets don't have much predictive ability, if this time the cause is different. The presentation is also available for download from CIBC's research list. Apologies if this current item is too far afield, but one quote struck me. Emergency responders can extrapolate the effects of the rising river, he said, but they cannot know for sure what works because they have never witnessed the river so high and therefore have no previous data with which to work. "You get above record levels, you don't know. You have nothing to reference it to," Slattery said. I think there is quite a bit of evidence that changes we have made to the natural world are making floods quite a bit worse. For example, all of the paving we do, and the changes we make to rivers' paths, so that they go more where we want them to go. Ironically, another thing that can make floods worse are certain flood control measures themselves. The construction of flood control levees along an upstream stretch of river can make downstream flooding worse, by virtue of the fact that water which would have flooded an upstream low-lying area now has nowhere to go and instantly heads downstream, thus increasing the intensity of the downstream flooding. There can be ugly conflicts arising when what is good flood control for one area becomes disaster for another. I'm sure that AlanfromBigEasy knows more about the details than I do, but if I recall correctly, during a major flood of the Mississippi River in the 1920s, political pressure from New Orleans big shots prompted the governor to order upstream levees be dynamited to purposely allow those areas to be flooded and thus provide some relief for New Orleans. The areas that were totally ruined by this deliberate flooding were largely populated by blacks and poor white farmers, many of whom lost everything. It's been said that the deep populist resentment stemming from this incident was one of the things that propelled the legendary career of Huey Long. It's also a good example of how lack of political clout can sometimes quite literally cost you your life. HOUSTON (ICIS news)--Conditions are building for a rough spring flooding season in the US midwest that could disrupt the transportation of many commodities including agricultural fertilizers, the National Weather Service (NWS) said on Thursday. ..Flooding could rival the high water levels experienced in 2006, and possibly 1997, Slattery said. The transportation of bulk fertilizers such as ammonia, potash, phosphate and urea by barge, rail and truck can be severely hampered by flood waters, which can close locks, bridges, rail lines, and roads. ..About half-way down the Mississippi from St. Paul to New Orleans, the big river is already near flood stage at Hannibal, Missouri, with minor flooding occurring at Hardin, according to the NWS Advanced Hydrologic Prediction Service. The NWS North Central River Forecast Center said that the greatest chance of major flooding along the Mississippi will occur during the period of 14-28 April. IF imported LNG and/or ammonia & urea [natgas sourced N-products] is truly cheap and affordable for the next few years: Pakistan's and Indonesia's desire to build up their Strategic Reserves of Urea may prove rather wise, if they can actually find the funding to accomplish this goal. 1) Extremely wet summer last summer. Record rainfall. 2) Extremely snowy winter last winter. Record snowfall. 3) Extreme warmup- all of the snow that fell this last winter melted over the course of only about a week or so. The soil is saturated with water around here. One good (bad?) storm could really be a bad thing here. My home is a half mile away from a decent size river, and only about 15 feet in elevation above it... Oh, and the sewagre treatment plant is also nearby, so if it floods I'll get a basement full of O-NPK too. I sure hope you don't have to take the perverbial lemon make lemonade with the NPK. Good Luck with that! Best wishes for you all up North got to admire the fighting spirit and still like the accent. And the Red River is currently at 40.66 feet. This is a new record, and an unusually early rise. One report I heard this morning suggested that the whole flood cycle in the Red River Valley may go on for weeks this year. Not good. How is the USA more like a banana republic or perhaps - better - an emerging market? Link courtesy of "The Baseline Scenario". Long read, but IMHO worth it. The problem for the USA is that so far it appears that Barack Obama is more of a puppet of the connected financial players than George Bush ever was (which would have seemed impossible). Bush was heavily controlled by other interests (military complex, oil)-Obama appears to be solely working for powerfully connected banking interests, most international in scope. Yea wasn't his Chief Economic adviser Larry Summers one of the guys who pushed to make deregulation of derivatives a law and nit just a regulation? Probably after the inauguration, someone had a quiet chat with Obama and told him the truth: the US is a sham democracy and the real rulers are the bankers, so, Mr. Obama, you can play at being president, but don't rock the boat too far. I dare say that everyone since, oh, Teddy Roosevelt has been told the same thing. Obama started out as an idealist with good intentions, but he's constrained by the powers that be. All US presidents are puppets--as is everyone in Congress: it's all for show. Either that, or he's not as progressive as he appeared, for many of his views are as orthodox as those of his predecessors, and some of his policies are positively boneheaded. His meeting with GW and the other living past presidents in January All Living U.S. Presidents Meet wtih Obama was probably when he got to hear the real deal, really a sit down intervention. Sounds like the shock doctrine an a nutshell. Excellent article over on salon about this. Quotes another ex IMF officials about how much we now look like an oligarchy and links to the Atlantic article in and update at the end. There is going to be blood in the streets this summer for sure. Yet another former Goldman Sachs official and long-time derivatives advocate who played a major role in the repeal of key banking regulations, Gary Gesner, is now poised to become Obama's chief of the Commodities Futures Trading Commission, the body charged with regulating commodities and financial futures. The sleazy, central role Goldman Sachs has played in the events of the last six months -- from their current CEO's still-unexplained presence with Paulson (its former Chairman) and Geithner (protegé of its other former Chairman, Robert Rubin) as the AIG bailout was designed to the massive government windfalls that firm has received (including from that very AIG bailout) -- is merely illustrative of how our Government has long functioned and continues to. I am rather impressed that some members of the USA MSM are starting to call out Barack Obama on his numerous deceptions. IMO those who support Obama's actions because he is "our guy" are no different than Republicans who continued to support George Bush after it became evident he was working against the nation. Japan is experiencing near total collapse. Japan, like the US, is trying to spend its way out of this deep recession with stimulus packages. Not likely to work there either. True, but Japan still possesses a cohesive society that pulls together to share the burden-the contrast with the USA and its tent cities, armies of homeless and massive prison population is quite stark. Esuyoshi Inaba, who heads the group's welfare division, says compared to a year ago, the number of homeless coming to the soup kitchen has increased by up to 50 percent. Inaba explains most of these men are day laborers, and companies are now laying off this type of contract workers. He expects that more and more young people will become homeless this year. That is because in Japan, contract workers often live in dormitories provided by their companies. So when they lose their job, their housing goes with it. Inaba says the government is not doing enough to provide shelter or food for these men. If it were not for groups like his, they would probably starve to death. Japan also has a high personal savings rate. I suspect that will help them. On the other hand, their national debt as a ratio of GDP is 180%, much higher than the U.S.
Japan also has a high personal savings rate. I suspect that will help them. Maybe and then maybe not. Japan and China are the top investors in US T-bills. T-bills are already flirting with a negative real return and the major buyer turns out to be the US Fed. So if the Japanese try and sell into this market they will take a major hit. But that is OK. Unlike the Chinese, the Japanese are US allies and friends. Let's watch how the US treats its friends. Fall in Norwegian Salmon exports to Asia - 2008 roundup . Total exports of Norwegian Salmon to the Asian markets have declined by 1900 tonnes or 11 per cent. The biggest declines have been in exports to Japan, which saw a fall of 1300 tonnes or 15 per cent, and South Korea, down by 670 tonnes or 28 per cent. Exports to other markets, such as Hong Kong and Singapore, have shown growth so far this year. I reckon 2009 will show that the bottom will disintegrate for this market and fish-farming / fisheries are the 3rd largest export from Norway. Little or nothing on this in MSM. The scale of Japan's export collapse is a reflection of our own reduced consumption. Of course, our consumption came back to us for years in the form of inward flows to our US Treasury market, funding tax cuts, funding wars, funding houses. What was called by Don Coxe "the great symbiosis." Now our consumption is no longer coming back to us. Plus, we are ramping supply of Treasuries. This makes for a rather nasty delta in global trade flows/US Treasury supply. And so you have monetization, by the FED. This type of situation has generally ended up in one place only. 1) They think that the government (more specifically liberals) is preventing us from drilling for untold bounties of conventional oil. Or that even sizeable increases in production in the US would send prices plummeting. 2) They think oil sands/coal liquefaction is cheap and is the ultimate answer to our energy problems (and also believe that the government (and again usually liberals)). 3) They think nuclear power is practically free. 5) They think that corn ethanol is just dandy. 6) They think that hydrogen for light vehicles is definitely without a doubt the future. 7) They think that electricity producing renewable reduce imported oil consumption. 8) They think that solar and wind will be able to eliminate fossil fuels (even liquid fuels) in the short term. I agree with your general points, but don't necessarily agree with the assertion that beliefs 1 and 2 are generally held by liberals. At least not by liberals as they're typically defined in the US. The "Drill Baby, Drill" mantra was raised to a near fever pitch by the Republican followers of John McCain and Sarah Palin who identify themselves as conservatives and believe firmly that the democratically controlled house and senate were restricting the areas that could be used by large oil companies. On the other hand, most of the folks on the Democratic side of the fence who are typically demonized as "liberals" seemed to believe that speculation and greed were the cause of the run-up in oil prices. Neither position reflected the true nature of the energy problems facing the US, and the world. Conservatives and liberals both have some pretty significant gaps in their understanding of energy issues. I'm not saying that liberals believe that, but that people who are uninformed as such they would take such positions blame the problem on liberals. Not to say that a majority of liberals are also completely uninformed on energy issues. That makes more sense. Thanks for the clarification. Tesla's first model, the Roadster, is aimed at the rich/eco-conscious. The Model S, at $50k, is still pricey but I'm impressed at Tesla's bid for utility: 300 mile range (with optional battery, price not given); 45 minute charge time (if you can find a 480V outlet); decent stowage or seats up to 7; swappable battery allows potential for faster 'fill up'. With regard to CO2 emissions, the US average is about 1300 lbs/MWh, with significant regional variation. Compared to the ICE, this is about 30% less with normal driving. The last caveat is important, because Lithium-Ion BEVs appear to drain charge much faster as their speed gets over 60 mph (and I would imagine for severe driving like steep hills, etc.). If you race the thing around, effective CO2 emissions rates could exceed an ICE. At today's relatively cheap electricity and gasoline prices, annual savings for the Model S is around $550/year, yielding a payback time measured in decades compared to the cost of a Toyota Camry. So it doesn't figure to penetrate quickly. But the Model S looks like a throwdown to today's hybrid cars, and the design with a future charging infrastructure in mind represents a bid to kill the ICE. Well that's more of a question of electricity replacing liquid fuels. In that case, solar/wind would still only be replacing fossil fuel electricity generation. * Land down 45 to 991…now down 947 rigs (-49%) from the 1,938 peak in late Aug-08. * Somewhat surprisingly, Oil was actually up 2 rigs to 217…now down 225 rigs (-51%) from the 442 peak in Nov-08. Is Canada going to zero?? Canada's rig count is very seasonal, for some reason. Gail my understanding is that they try and time the market demand a bit more being less AC dependent and also many areas are inaccessible in the summer and need to be drilled when the ground is frozen. Much of Canada's drilling is done in winter when the ground is frozen. This enables the rigs to reach into muskeg areas, the eastern slopes of the Rockies, and other roadless places where a heavy truck would sink into the ground even in a dry summer. Even on the semi-arid flatlands of the prairies, winter drilling allows bigger, heavier trucks to make fewer trips to the site. Also, the provinces have load limits on highways that are reduced in spring and summer, in many counties down to 50% of the winter limit. It's spring breakup Nate. The muck melts and it becomes impossible to move or supply rigs. The active rig count drops at this time every year. The ghost of the Sudden Stop now stalks the markets. As a big believer in the behavioral over the structural in economics, I like the concept because it is indeed very structural and not so discretionary or behavioral. For example, the recent monetization of Gilts and Treasuries by the BOE and the FED, respectively, is in large part because capital flows are simply falling. Alot. Falling because of reduced global trade. We have reached a structural limitation. Meanwhile, are you looking at the reduced dividend trend from Canadian Oil and Gas Trusts? I suspect there's a free glimpse into the world of EROI there, as payouts crash further than the average price of oil might suggest. Again, structural limitations. While previous economic crises, especially in Emerging Markets, were no doubt marked by a discretionary reversal in flows, papers such as the one below are worth reading I think. At least to get a sense of Sudden Stop. What's concerning about monetization just now is not that the deep hole of debt can be filled up easily with fresh paper, or can be done so quickly. What's concerning is that monetization appears at the same time the data shows the risk of structural limitation on inward flows has arrived. In addition, there is the secondary risk that observers have an ephiphany about the operation, and change their behavior. Quickly. For example, one can imagine an epiphany coming more quickly should inward flows fall further, and it's "observed" that the FED has to accelerate monetization. In both Oil and Gas supply, and in sovereign debt, there is rising risk that a Recognition Phase unfolds next. In potentially spectacular fashion. 'Another group is warning that we are on a crash course towards oil shortages in the near future. When demand picks up again, there won't be oil in place to support the expansion of the economy and we'll probably see another spike in oil prices. dam. CERA been talking this way recently? the comments are telling re our not being energy educated. ; all over the place. Jeff Rubin, one of Canada's most outspoken and occasionally controversial economists, is leaving Canadian Imperial Bank of Commerce at the end of March. Mr. Rubin, currently the chief economist and chief strategist of CIBC World Markets Inc., has announced that he is going on to pursue other interests, including his new book that will be published in May. Mr. Rubin accurately predicted in 2000 that oil prices would hit $50 (U.S.) a barrel within five years. He recently forecast that oil will reach $225 a barrel by 2012. His book, Why Your World Is About to Get a Whole Lot Smaller, is due out in May. In a news release Friday, publisher Random House Canada said the book looks at ways in which oil scarcity will lead to the end of globalization. Mr. Rubin said in the release. “It's a book about the way the world is about to change. We've all got our eyes right now on the global financial meltdown, but I believe that oil scarcity will change the global economy even more profoundly and in the process change all of our lives – from where we work to where we live to what we eat.”"
This sounds like an interesting title to watch out for. ..."Lakes in Siberia are five times bigger than when I measured them in 2006. It's unprecedented. This is a global event now, and the inertia for more permafrost melt is increasing." The above quotes are only from the first page of a 3 page article. More Liberal Lies to deny me my divine right to prosperity, and to have "Fat Al" sell more books. Besides, Jesus will save me! Scary enough article, but the comments section makes me grateful that there's at least 'some' maturity here. It's just constant "Oh Yeah?" "Nuh-uh!" "Yuh-huh!" I wonder what their editors are thinking? Before anyone asks, I'm not challenging global warming but arctic sea ice extent seems to be very late in starting to decline this year. Has anyone seen any recent commentary on this (by someone who knows what they are talking about)? Yes, one would expect the maximum to come closer to the middle of march than the end. That said, it's not particularly important, as the minimum is the big issue (Actually, total ice volume is the most important metric, but is the hardest to come by). You might want to pick up a copy of "Water: The final Resource". The authors mention that water vapor is the main Green House Gas and that CO2 is 0.3% of water vapor in the air. Therefore, the CO2 is not the big GHG producer indicated by others. Their assertion is that the Pacific Decadal Oscillations and the Atlantic Miticadal Oscillations coupled with lower sunspots are returning the Earth to a colder temperature regime. They also cite the Maunder, Dalton and two other "Minimums" that occur every 180 years or so. We are approaching the next "Minimum". They also say that volcanic activity can play a large part in atmospheric temperature regulation such as from Tambora and Pinatubo. Interesting reading with references. I have not checked out their references to see if they are peer reviewed. Australian newspaper reporters are doing their best Thursday to entice BHP Billiton into spending the $6.3-billion it just raised from bond sales on a bid for Potash Corp. of Saskatchewan. The Australian, a reputable national paper down under, devoted considerable space Thursday to speculating on just what BHP might be up to. The cash isn't needed to fund capital spending, so an acquisition seems likely. The opening guess is that BHP brass don't have a clear target, they just want to be ready to chase any opportunity in commodity plays that opens up as the recession plays out. Door number two was another possible try for Rio Tinto. It would seem to be a logical globalization goal to make a Corp. have enough 'Real Asset Intrinic Value' that it would become largely immune to any fiat-currency acquistion by a Govt. [China?] that might then seek to bend its production to an geo-strategic political end. I am of very limited expertise in this area, but recall the earlier controversy when China attempted to buy Conoco. The US Govt decided it was better for Chevron to own it, even though China had a higher bid. tontoneila,don't put too much faith in the prognostications of "The Australian".It is a Murdoch paper which has gone steadily downhill in terms of credibility for many years from a promising start. In fact,the MSM in Australia is,by and large,crap.It is owned,in the main, by News Limited and Fairfax,and both are corporations with strong ties to the governing oligarchy in Australia. "China attempted to buy Conoco. The US Govt decided it was better for Chevron to own it, even though China had a higher bid." i think you are refering to union, not conoco. chevron ended up with union. conoco merged with phillips petroleum. Things are out of control in Fargo. Check the flood impacts at the bottom of the page. Looks as if the curve on the graph is bending over. Unless there is a wall of water unleashed, I don't think it is possible to get an inflection point to bend it upwards to match the prediction. My understanding is since it flows north it flows into a region thats still iced over breaking up the ice and effectively damming the river causing it to crest even higher. I actually have seen this sort of effect in the North East during some fast thaws the ice itself causes the flood waters to back up. I just read this and it matched what I've actually seen. Sandbaggers out in full force, at least 10 RM (rural municipalities) declared disaster zones, lots of evac. And we don't crest for more than a week. I bought in one of the older areas of town, higher up and miles from the river - didn't flood here even in 1950 (wasn't part of the city then either - how things change) Still, everyone is watching the rivers, and we are getting more snow today after receiving a good foot on Friday. I have been following these flood charts for years and they are usually on the plus side. CYA I guess. ..As a member of the Las Vegas department's auto-theft unit, Mr. Menzie is on the front lines of a phenomenon that police departments and insurance companies worry could be burning out of control. "The economy is stretching people to the breaking point and some of them are willing to risk criminal conviction," said James Quiggle, a spokesman for the Coalition Against Insurance Fraud, an industry-backed group. "They look at this as their own personal stimulus package." Just another way that gets poor and financially stressed people to pedaling bicycles or riding mass-transit,IMO. Ironically, due to Jevon's Paradox: this sad trend makes it easier for the rich to keep fueling their Hummers on the cheap. Saudi Arabia has 260 billion barrels of proven reserves, enough to keep pumping oil for the next 89 years at today’s rate of production. I guess it's because they are producing at a lower rate. Of course, at their current rate of increase in consumption, they would be consuming about 200 mbpd in 89 years, and therefore importing over 190 mbpd--at today's rate of production. Saudi Arabia has had 260 billion barrels of proven reserves for well over 20 years now. At that rate of decline they have enough to last forever. The US has had 30 billion barrels of proven reserves for well over 20 years now. Not saying it's the same thing, but that alone doesn't prove anything. That's the point. It doesn't prove they have staying power. But the fact that they have been producing heavily since the 80's without dipping into those reserves at all, well that is highly suggestive of what the number means. In the US too, but at least we have better visibility on the source of that number.